Here’s an easy way to understand the widening gap between Metro Atlanta and the rest of Georgia. 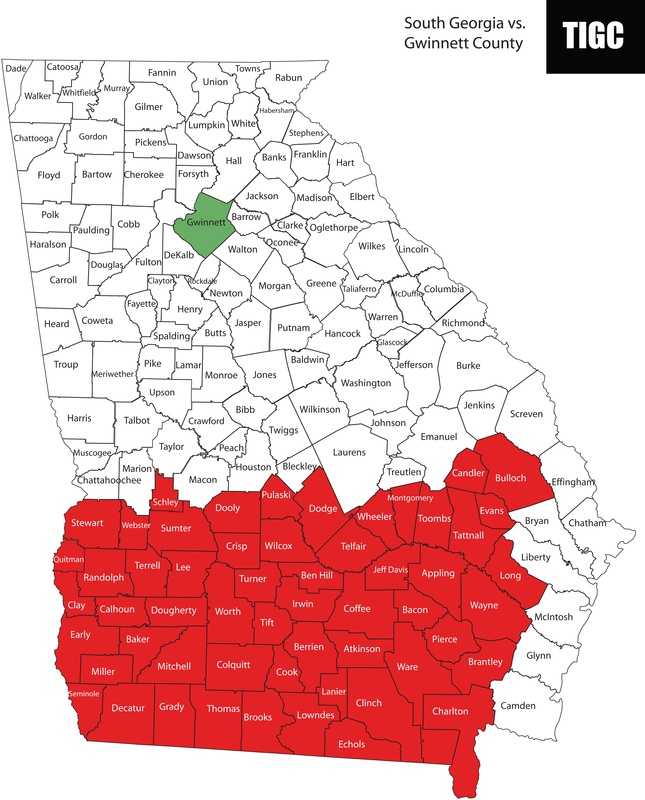 Compare all 56 counties of interior South Georgia to Gwinnett County alone. Gwinnett County’s 2013 population was estimated at 859,304 – just under three-fourths of the 1.16 million people living in our 56-county South Georgia region. Generates more income and contributes more in taxes than all 56 counties of South Georgia combined. According to IRS data, Gwinnett County’s total income for 2013 was $21.2 billion versus $17.4 billion for South Georgia. Similarly, Gwinnett County taxpayers paid $2.5 billion in federal taxes while South Georgia taxpayers contributed $1.7 billion. Consumes substantially less in social services than South Georgia. In 2013, as one example, Gwinnett County consumed less than a third as much in Medicaid services than South Georgia. The federal share of South Georgia’s Medicaid costs totaled $927.6 million; Gwinnett County, $266.2 million. The picture for SNAP (food stamps) and other social benefits is similar. Is home to significantly more college graduates than South Georgia. Based on data compiled by the U.S. Department of Agriculture’s Economic Research Service (ERS), there were 175,290 college graduates in Gwinnett County over the period 2009-13 versus 110,576 for all of South Georgia. This hasn’t always been the case. As recently as 1990, Gwinnett County and South Georgia were basically tied in this category: 65,281 for Gwinnett and 63,073 for South Georgia. Sends more students to University System of Georgia colleges than all of South Georgia. This is also a recent development. A decade ago South Georgia still sent significantly more kids to college than Gwinnett County – 5,117 versus 3,762. But by 2011 they were basically tied. South Georgia sent 5,498 kids to college while Gwinnett County sent 5,493, according to University System of Georgia data. Since then the gap has widened steadily, and in 2015 Gwinnett County sent 1,100 more freshmen to University System colleges than South Georgia. Is substantially healthier than South Georgia. Using premature death rates as a proxy for health status, Gwinnett County is about twice as healthy as South Georgia. The 2015 YPLL 75 rate for the 56-county South Georgia region was 9,823.3; for Gwinnett County, it was 5,163.2 (with YPLL 75 rates, the lower the number, the better). In this category, South Georgia has actually gained a little ground over the past 20 years. It’s improved about 5.4 percent over that period while Gwinnett County has been essentially flat. But South Georgia’s numbers in this category are abysmal while Gwinnett County’s are pretty close to optimal, especially for a county as large and diverse as it is. For 2015, Gwinnett County’s YPLL 75 rate was the fifth best in the state, and it has consistently been in the top tier of counties in this category. Produces about half as many criminals as South Georgia. In 2015, according to Georgia Department of Corrections data, South Georgia sent more than twice as many people to prison than Gwinnett County did: 2,403 for South Georgia versus 1,049 for Gwinnett. The picture for new probationers is similar: 5,956 for South Georgia versus 2,630 for Gwinnett County. In a future post, we’ll take a look at political and cultural trends in Gwinnett County and South Georgia. ← A Data Mash-Up: University System of Georgia vs. Georgia Department of Corrections. It’s not pretty. Gwinnett is also far more diverse than south Georgia. 25% of the population of Gwinnett was born outside the United States. 57% are White. 11% are Asian. 20% are Hispanic. 27% are Black or African American. I’m afraid the changes that South Georgia would have to make to attract the businesses and people like Gwinnett has aren’t something the average citizen in Waycross or Adel are willing to make. Thank you for a revealing and informative comparison. I’ve been doing a great deal of thinking this past election season and think the divide between rural and urban/suburban areas drove a great deal of the outcomes. There must be a sensible way forward to ensure or at least encourage financial security and stability so folks can continue to live with the usual uncertainties rather than additional ones when a way of life is seeing radical change for the worse. Well, when I went to a presentation at Case Western University, they stated that 90% of college graduates live in cities. If you have a large and educated populace, the stats are going to be better. The people are going to be healthier. I don’t see what’s really surprising here, although it’s interesting. 1.What is the ratio of jobs offered ? in this north county verses South Ga ? 3. We really need jobs in South Ga.
4. Should our state be decided into two states . 5. We have 4th and 5th generation welfare recipients. That creates low work force and high crime. people need hand up not hand outs. Last. God bless each one of you! All of these statistics can be explained by one variable. There are way more good jobs available in that one county compared to the 56 in South GA. Businesses think they can’t build a facility outside of the Atlanta area.